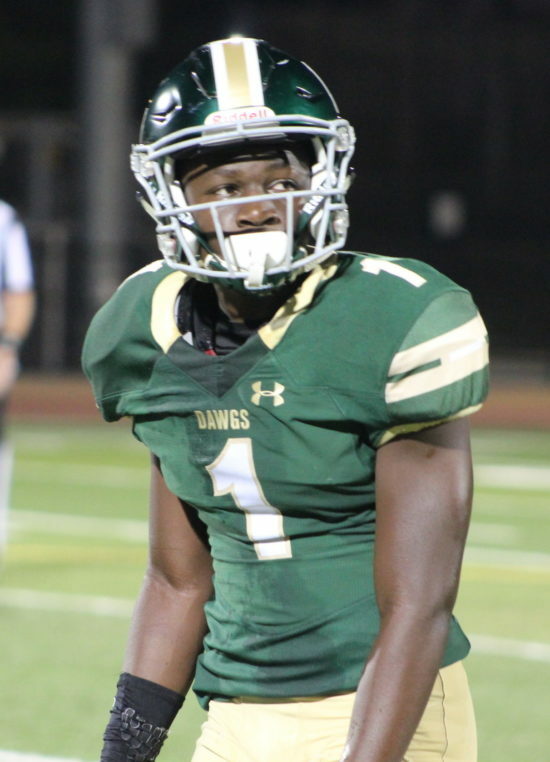 Thonye Charles had two TD receptions to help South Hills to a win over La Mirada. 26 Comments to "Mid Valley Scoreboard: Week 4"
In Medrano’s defense cantwell wasn’t supposed to be this bad, they had a nice team coming back and it all fell apart. Ugly game of the week. El Rancho vs Cantwell. What to do. Probably Medrano’s toughest coaching decisions. Have to keep his 1’s fired up and ready for Whittier next week but does not want to humiliate Cantwell. Don’t run the no-huddle? Can’t do it have to stay sharp. Don’t play huge linebackers. Can’t do it. They need to be fed. Answer. Agree to a running clock in the second half even if the lead is not big enough. 24 points should do it. Play your 2’s and 3’s in the second half and never schedule a game like this again. You are going to pay for scheduling two cupcake games before Whittier. Both u clowns need to actually watch the games. Since it’s obvious you never played a down. At the end of the day a win is a win and a loss is a loss. You don’t get any extra wins for how bad you beat someone. You should be more worried about whether or not Monrovia can beat South Pasadena, TC or San Marino. Otherwise you’ll be watching Covina play in November while your Wildcats wonder if they hired the right coach. I keep waiting for the one Monrovia dufus’s DELETED to drop and he just posts under 1 alias. We won. Now shut YOUR pie hole. Covina is finishing 3rd in there league. Remember all the hype before the season started that Covina was supposed to be unstoppable. Covina was supposed to blow Monrovia out, and they almost lost. Are you kidding me. Colt45 you are as delusional as they come! Covina was extremely lucky they won that game. Other than the rb, Monrovia had the best athletes on the field. Monrovia Rb and Rec ran all over you guys! Covina Qb is overrated and I hear you guys have a 19 year old Super duper Senior. Where was he all night? To Annonymous, I am not a cathedral guy but yes you are annoying with that Cathedral Bashing, You are either a disgruntled Cathedral grad or former player. A Salesian Grad than I would understand. I am getting tired with all your Hatred for Cathedral. Other people read this crap and jump on the bandwagon. Cathedral get’s a bad wrap especially from you Annonymous. If you want us to understand you than what did Cathedral do to you. How did Hoover put up such a relatively respectable score against Burbank? Are they slowly becoming a not-horrible team? Is Burbank not that good? Did Hoover get a couple of garbage time, consolation TDs against Burbank’s scrubs? @ The entire blog, Is my personal vendetta towards Cathedral getting old? I would like to know. Your feed back would be greatly appreciate. Not that it will change anything but I want to know how or if I am annoying, or do people agree with me. LS, what’s your angle coming on here and making ridiculous statements (ex, “Build a Wall”, “La Serna will leave the DRL”)! Not even sure if LS is a true fan of the Lancer program. If he were he would be humble, just like the LS kids and coaches are on and off the field. I believe you just get on here claiming to be just so that you could get under people’s skin. This week the Lancers face a tough opponent in Warren. Not going to be at all easy. The point is you keep bashing Cathedral and it’s getting old. What do you care what the phantoms do. What did they do to you moron. @ Anonymous, I don’t say anything about any program but cathedral. Why ? Don’t really care about bashing any other program but cathedral. I am the coward. Ok “Anonymous “. Look in the mirror before you speak. Don’t like my comments don’t come on this blog. All this complaining and crying and excuses for why you guys lose makes you sound like females. And I’m saying that nicely. When do you cathedral people own up to getting beat straight up and not point the finger who’s fault it is. Way to rep your program MORON!! To Annonymous. You are the one who is a joke. You keep bashing Cathedral and other school’s every chance you get. Nobody hates Cathedral but you. A coward behind the keyboard. Thoughts from this past week. All this talk About how Monrovia couldn’t hang with Covina and Covina was gonna mop the dust on monrovia was all just noise. Brick pack garbage. Monrovia nor covina has a stout defense as of yet. And Covina is lucky they got away with a 7 point victory. Now I’m hearing CV is the best in the pacific???? When they beat Burbank then and only then will I be made a believer of that statement. Burbank is cream of the crop in that league with either Muir or Arcadia right behind them…based on history that I know of. When it comes to you hyped up LS fans….Since you believe your team is sooooooo much better then the rest of the Del Rio, I’m expecting your league games to be 21 point margin of victories and nothing less than that!!!! Yes I see that you had a tough non-league schedule, but that doesn’t always mean that you’re just gonna run through the league….you’re just highly favored to do so. Cv has one of the best players in the pacific league (the qb). But running him 25-30 times a game will take a toll on his body late in the season. Cv will go far if he (qb) is healthy. Muir played hopefully what is their worst game of the season. 4 td drop passes and a lot missed tackles. Pacific league will end with a 3 way tie for first. Arcadia , Muir , CV! The TRUE LS Family? What a joke? Most boosters are a bunch of phonies. If I shook your hand I would end up missing fingers. It is about football only and that I can get behind. Take your love and kisses to your booster parties. CV lost to both Burbank and Arcadia last year, not much has changed as far as rosters for all 3 teams so what makes you think CV is the team beat? I’m an old school stadium wy dude. For Cathedral to beat Loyola and be in the same sentence with Amat.is crazy. I think we were D20 in 81?? CV team. This season CV showed up with a very young undersized much less athletic team that not only bullied but finessed Muir off the field. I could only imagine the damage CV staff would do with that Muir talent.